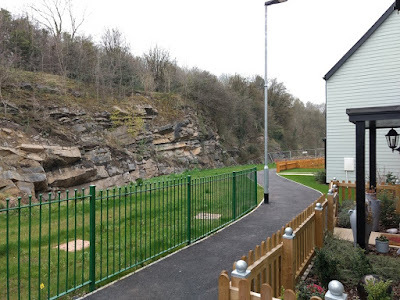 "New exposures of our local geology are being seen, summer 2017, as work to put in new railway tracks between Bristol Temple Meads Station and Bristol Parkway, continues with some pace. David Moore photo-recorded this cutting into the Saltford Shale, Lower Jurassic strata, Monday 21st August from the Filton Abbeywood Station footbridge. (If one zooms in on photos perhaps fossils might be seen. Do let us, Avon RIGS Group, know, if you do.).". Thanks to David for his work. The following information is from the BGS Lexicon of Named Rock Units. 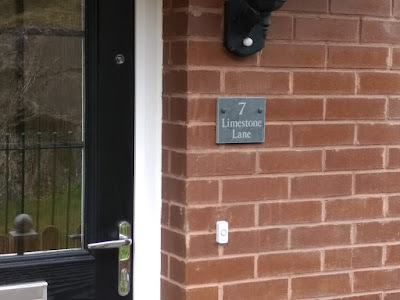 Mostly grey, fissile or blocky, fossiliferous calcareous mudstones; a few limestones. Placed at the base of mudstones resting on the highest limestone of the underlying Wilmcote Limestone. Placed at top of Bed 26 at type section (Donovan, 1956). Placed at the base of an interbedded argillaceous limestone ('cementstone') and mudstone sequence. At base of Bed 22 at type section. (Donovan, 1956). 4.27m at type section, 20-30m over most of Midlands. Type Section Section at Saltford railway cutting southeast of Keynsham, Somerset (Donovan, 1956, p.182-212). Reference Section BGS Twyning Borehole, 82.25 to 114.80m depth. Reference Section BGS Stowell Park Borehole, 1932' 0" to 2028' 6" depth. Donovan, D T, 1956. 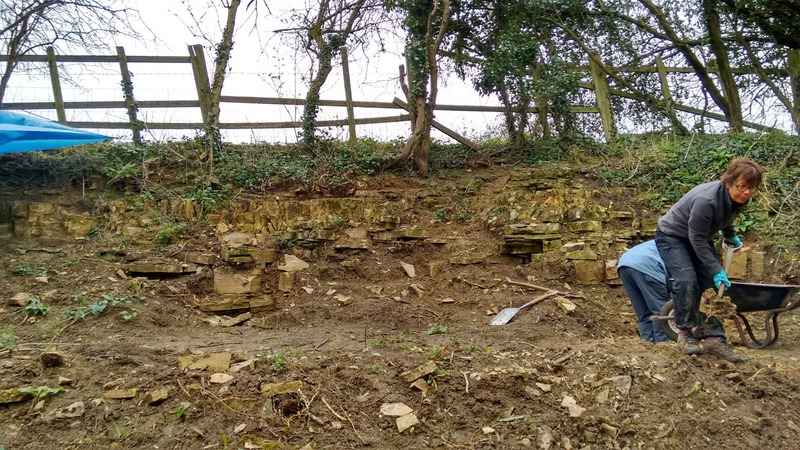 The zonal stratigraphy of the Blue Lias around Keynsham, Somerset. Proceedings of the Geologists' Association, Vol.66, p. 182-212. 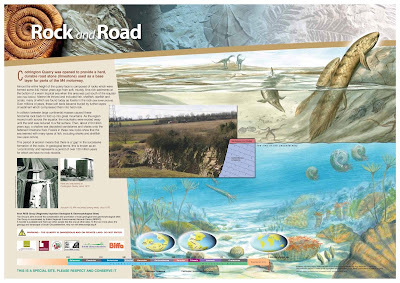 The story of geology & landscape in South Gloucestershire was published in April 2007 hard copy format as a collaboration between South Gloucestershire Council, the Avon RIGS Group, BRERC and Bristol Museum. Although paper copies are no longer available, this excellent thirteen page booklet is still available as a free-to-download pdf below. 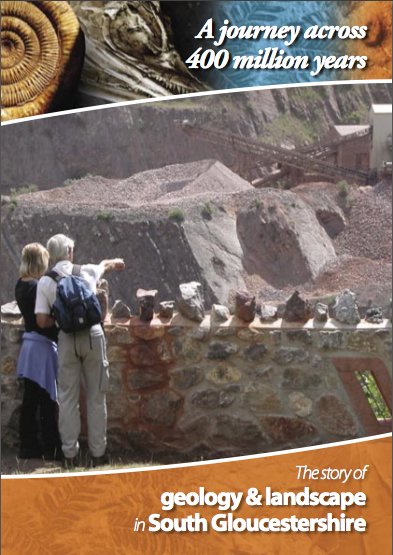 Click Booklet to download in PDF format. Fourteen local sites, including Aust Cliff, Huckford Quarry and Wick Golden Valley are featured. Each outcrop is described and interpreted with cross sections, location maps and annotated photos. The archive of the paper copies of OUTCROP can be accessed by clicking Here . This will take you to Issue 15. Later issues can be seen by clicking on the links below. Backwell Hill, where the BET nature reserves are located, is part of an anticlinal structure which forms a dome called Broadfield Down. The two reserves are on the North facing slopes of the Down. The topography of the Down follows the underlying stratigraphy, as can be seen in the face of the disused Coles Quarry from the access path viewpoint. View into Coles Quarry and across to Wales from the access path view point. The part of the British Isles that includes Broadfield Down was then drifting slowly North from 20 - 25 degrees South of the equator. It was part of a tectonic plate that included the continents of Baltica and Laurentia. This plate was separated from another plate called Gondwana by the Rheic Ocean. Gondwana included the future continents of Africa, South America and the rest of Europe and Asia. Scotland and England had been recently united by a collision between the plates of Laurentia and Avalonia. This collision closed the Iapetus Ocean and caused a wrinkling of the Earth’s crust which resulted in a mountain building process called the Caledonian Orogeny. In Greek mythology Iapetus was the father of Atlas for whom the Atlantic ocean was named, so the Iapetus ocean can be seen as the precursor of the Atlantic. These massive mountains are called the Caledonides and, as they started being quickly eroded, the material produced was carried South by massive meandering river systems in an arid continental, desert environment. This material was laid down and lithified to form sandstone beds which are known as the Upper Old Red Sandstone. The name comes from the red-brown colour from the oxidised iron, haematite, coating on the quartz grains. Within the Old Red Sandstone are fine grained mica-rich sandstones, shales and mudstones. These rocks form the cores of the Mendips, Broadfield Down and Failand Ridge. They are known as the Portishead Beds and can be seen exposed along the coast between Clevedon and Portishead. 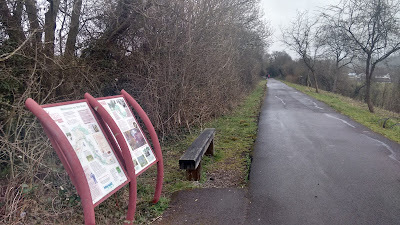 There are also some small exposures in the bed of the track that drops down from Cadbury Camp Lane under the motorway to join Clapton Lane near the Black Horse pub. 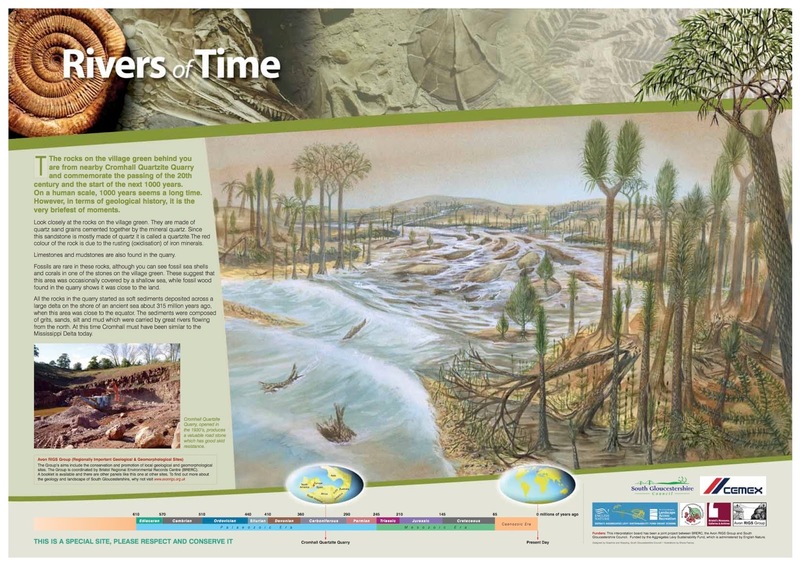 The Devonian period came to an end about 360 million years ago ( 360 mya ). At the start of the following Carboniferous period ( 360 – 300 mya ) all the continents had moved together, adding Laurentia and Gondwana, closing the Rheic Ocean. The British Isles were now moving slowly northwards across the equator into the northern tropics. Shallow seas started to cover the Devonian desert. Various limestones were deposited in these warm, shallow seas. Some of these limestones are oolitic – consisting of small, < 2mm, egg-shaped particles called ooids. Because they were shallow and warm, there was a high evaporation rate which made the seawater supersaturated. These were formed in a similar way to rolling snowballs. Calcium carbonate accreted around a particle, of shell or sand, and the ooids grew in size as they were rolled around the sea floor in the lime saturated water. This process now continues in the Bahamas. One of these limestones is Clifton Down Limestone which forms the crags alongside which the Geological Trail was built. Many of these limestones contain fossils, crinoids, corals and brachiopods, and are very common in this area. Fossils can be seen where the host limestones were used for building, such as in the walls along Stockway North and in the parapets of Jackland’s Bridge in Nailsea and in the rocks used for building the drystone wall along the Northern side of Cadbury Camp Lane West, to the West of Cadbury Camp. Not many of these fossils can be seen on Backwell Hill but an exception is an excellent specimen of Siphondendron Martini ( Lithostrotion ) that was found on a rock pile near the view point at the top of the trail during a geological field trip by the Bristol Naturalists. The seas gradually shallowed so the formation of limestones stopped. Rivers brought material to the area and deposited quartzitic sandstones on top of the limestones. These are generally known as Millstone Grit. The climate had changed from arid to equatorial conditions so the rivers increased in size and flow because of the increase in rainfall. Swamps started to form and the rivers formed deltas on the coasts. Primitive plants such as horse tails grew in these swamps and as they died, peat started to form. 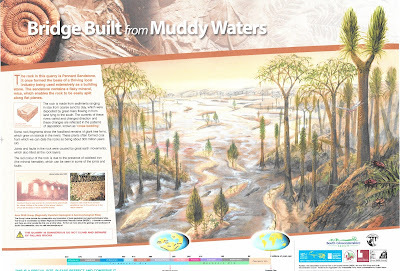 These swamps and deltas were periodically flooded as the sea level rose and fell. The rivers deposited material eroded from the high ground formed by the continuing orogeny which covered the peat with layers of sandstone. These sandstones compressed the peat which was slowly turned to coal. As the rivers meandered and moved away, plants started taking hold again and so there are repeated cycles of clay, coal and sandstone that can be seen in the Nailsea coalfield. The records of the Watercress Farm borehole, that was drilled in 1903 while looking for a water supply for Tyntesfield demonstrate this. These repeating cycles are called cyclothems. The clay is the relic of the soil that the plants grew in and is invariably found below a coal seam. Coal miners call this ‘seat earth.’ This clay is commonly used to line furnaces as ‘fire clay’ and would probably have been used in the Nailsea glass works’ kilns. 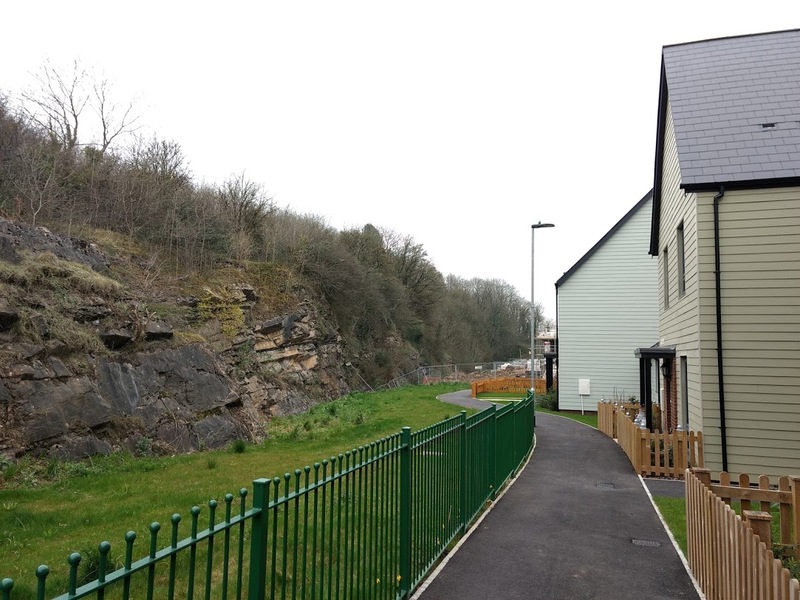 It was also used to make bricks in, for example, the brick works that existed adjacent to the shafts of the Dean Lane coal mine in Southville. 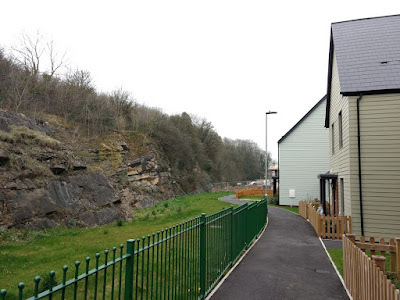 The coal seams crop out at the surface on the northern slope of the Nailsea syncline and this is where mining probably started using drift mines to follow the seams. This area was surveyed in 1950 by the Coal Board to assess its viability for surface coal mining. Deep shaft mines followed later, towards the centre of the coalfield. William Smith – known as the ‘Father of Geology’ - carried out a survey for the mine owners in 1811 to see if the coal output would justify the building of a canal to take the coal to market. In his opinion it was and he sounded very optimistic in his report of 1811 and some of the necessary land was purchased but the canal was never built as the competition increased form the South Wales coalfield. As the Carboniferous period progressed, the Rheic ocean closed and so there was increasing tectonic pressure from the South West. This is called the Variscan Orogeny. It resulted in crustal folding in the area and formed the Mendips, Broadfield Down, Failand Ridge and the Nailsea syncline. 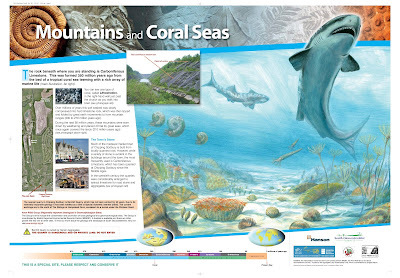 It continued for some 100 million years into the Permian. The rivers bringing erosion material from the North reduced so the formation of deltas slowed and eventually stopped. 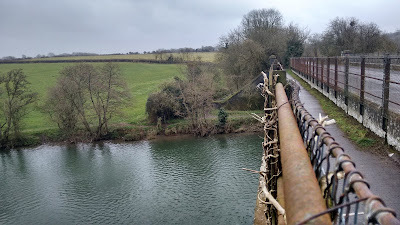 Rivers then started flowing into the area from the South and East, bringing large quantities of sand that were laid down across an area from Swansea to Oxford. This is known as the Pennant sandstone which can be seen in the faces in Conyegar and Nowhere Quarries. The Pennant is up to 330m thick in the area and contains thin coal seams. There is also a good exposure of the Pennant at Trooper’s Hill in Bristol. The direction of the rivers that supplied the material can be inferred from the channels and dune structures seen in the Pennant Quarry faces. This is called cross stratification. All the land masses then united to form the supercontinent Pangea. At the end of the Carboniferous period there are no rocks to be seen in the area from the following period, which is the Permian. 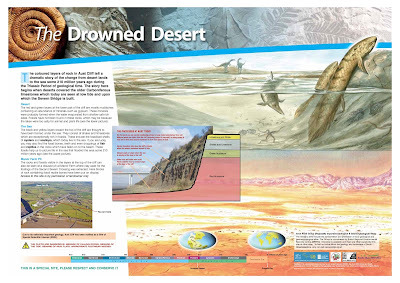 ( 300 – 250 mya ) This could either be because the conditions were not right for any deposition to take place or they were deposited and have since been eroded away. 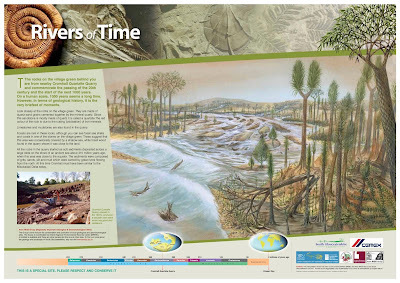 The next geological period is the Triassic. ( 250 – 200 mya ) The mountains that were created during the Variscan Orogeny are being rapidly eroded during this time. The coarse-grained products of this erosion are known as Dolomitic Conglomerate which can be seen as a skirt surrounding Broadfield Down. 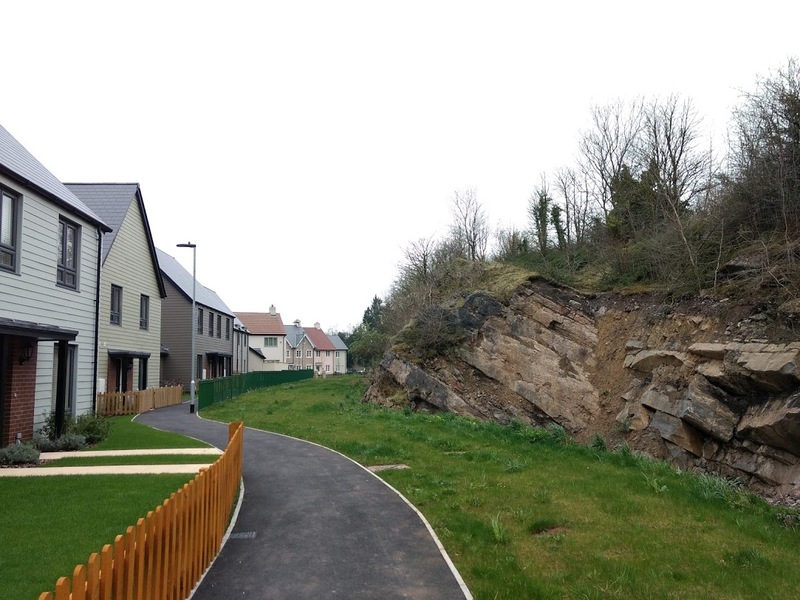 They create an unconformity with the Clifton Down Limestone that can be seen in, for example, the path bed running down from the Jubilee stone to Church Town. It can also be seen in the old quarry face in the disused Cheston Combe quarry. 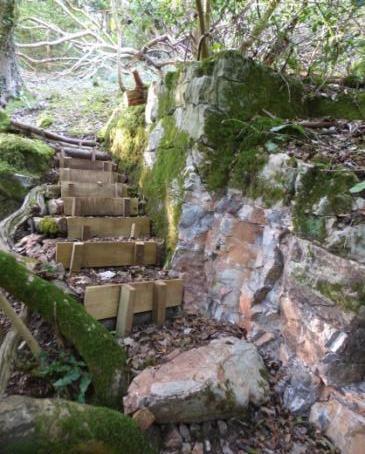 This unconformity can also be seen in many areas around the area, in the Tyntesfield quarries for example. This conglomerate has been used as a building stone in the area. It is probably best seen in the walls of the Tyntesfield sawmill. A similar rock, from Draycot Quarry on the South slope of the Mendips was famously specified by Brunel for building Temple Meads railway station. The fine grained deposits are called Mercia Mudstone and can be seen surrounding the area as they merge into the dolomitic conglomerate. No rocks from the following periods, Jurassic ( 200 – 150 mya ) and Cretaceous ( 150 – 66mya ), remain in the area so, again, either they were deposited then eroded away or they were not deposited in the first place. Recent Quaternary ( 2.6 mya – present ) Drift material covers the low lying areas surrounding Failand Ridge, such as Nailsea Moor to the South and the Gordano Valley to the North. This is mainly Peat and Alluvium – clay, silt and gravel. This means that Broadfield Down is an eroded Carboniferous dome structure in a Triassic landscape. It is remarkable how much complex and interesting geology exists in such a small area. After much discussion by the trustees about the possibility of a high-level cliff path in Badgers Wood, the project was given the go-ahead in the spring of 2013 and was finally completed in October 2014. 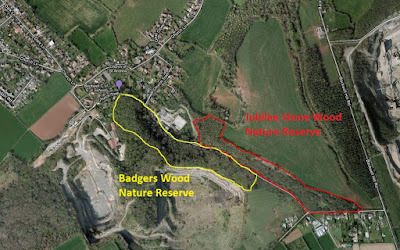 In total, the new trail is around 350 metres long and runs along the base of some of the fantastic limestone cliffs to be found in this part of the woodland. 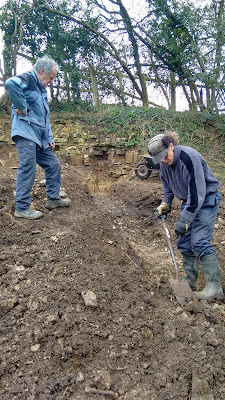 The first and last sections have been relatively straightforward, but it was the bit in the middle, close to the cliff faces, that have required the full engineering skills of the trusty BET volunteers. We decided to start the trail in the middle, so if we ever felt we couldn’t overcome some of the more challenging technical problems, we could always simply walk away and no one would be the wiser! 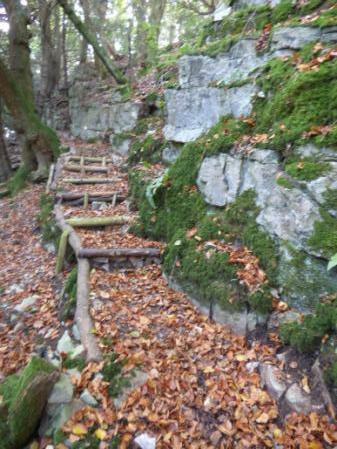 The problem was that some sections of the trail had to be constructed on a very rocky, steep slope so the only real solution for us was to attach metal cages to the rock faces, fill them up with many tonnes of rock and then put the trail on top. Although this took a long time to do, I’m very pleased with the finished result as it’s now quite difficult to see the sections of trail that would once have been in thin air just a couple of years ago. The Geology Trail branches off the Fern Way close to the start/end of that trail. One word of warning though.... the trail does have some short, steep sections and you may need a head for heights on the more ‘challenging’ middle section! The route of the trail is shown on the updated BET Map. Description of Clifton Down Limestone. The lithology is dominated by calcite mudstones with a locally abundant but low diversity fossil assemblage. At Burrington Combe the formation is about 170 m thick, and three subdivisions can generally be recognised across the Mendip area. The lowest unit comprises a mixture of calcite mudstones, white oolitic limestones and dark splintery limestones. This interval is relatively expanded in the Cheddar area, where a 38 m thick dark limestone ('Cheddar Limestone Member') is overlain by a 58 m thick white oolitic limestone ('Cheddar Oolite Member'). The middle part of the succession is dominated by fine-grained, grey-black limestone with nodules and bands of chert and abundant remains of the coral Siphonodendron['Lithostrotion'] martini ('Lithostrotion Limestone'). Porcellaneous calcitic mudstones dominate the highest part of the formation, including locally developed algal mudstones and stromatolites, indicating deposition in a very shallow-water, near-shore or lagoonal environment. Splintery dark grey calcite and dolomite mudstones, pale grey oolitic, dark grey bioclastic and oncolitic limestones and some mudstones. Scattered cherts and silicified fossils in lower half. 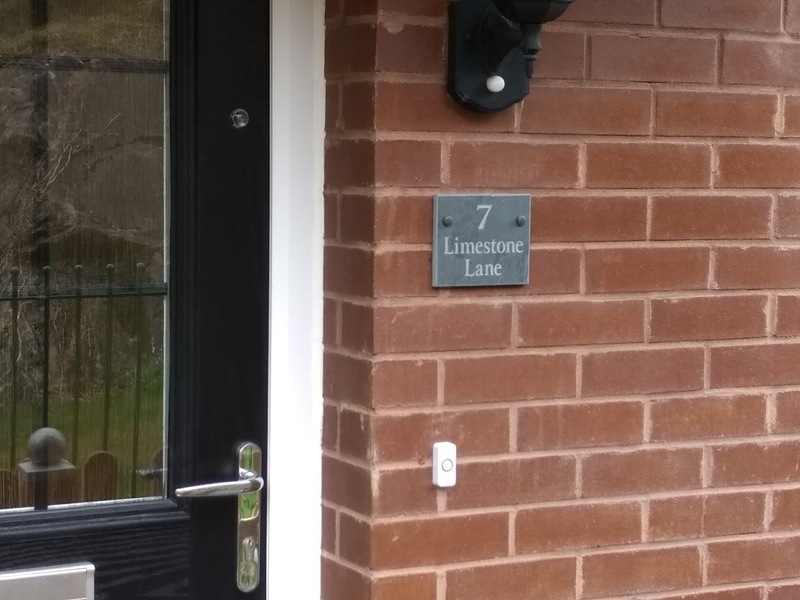 Sandy limestone at base in Bristol area. Deposited in a barrier/back barrier/shelf lagoon setting. Age range: Arundian Substage ( CJ ) - Holkerian Substage (CQ ) Early Carboniferous. Thickness: Up to 266m in the Avon Gorge, thinning Southwards to 150 - 200m in the Mendip Hills. Grateful thanks to the BET Trustees for their permission to reproduce items here from their web site. Progress Report -- & Advertising of the Exposing Work to Continue to its ‘Cotham Marble Conclusion’, and the further great enjoyable opportunity to be a part of the work: later in the year …. Watch this space! 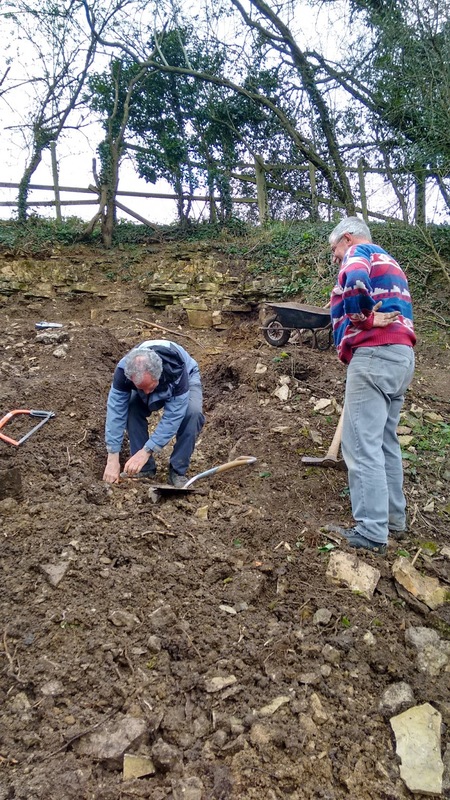 …..As we local keen geo folk : Dig for Marble ! About a month back, - earliest Spring (just about!?) -, a very good and keen team spirited group of a few (human! 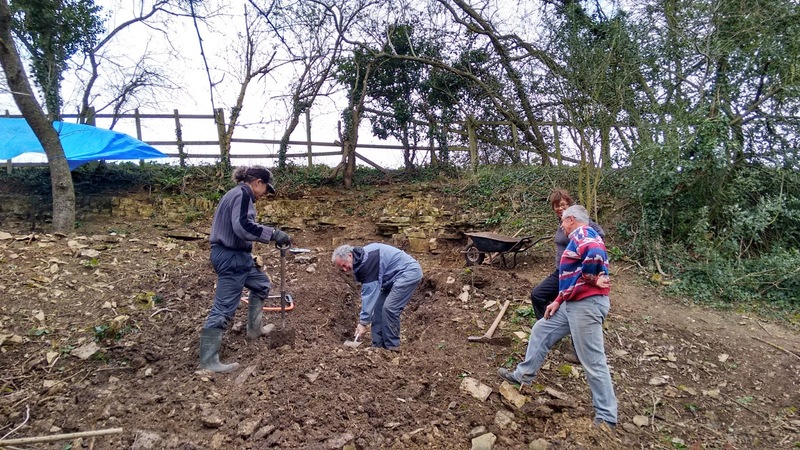 , not JCB) diggers, joined, over a few nourishing and warming flasks of sustenance, and dug happily for several hours, from a nice relaxed 10.30 or 11 am start. 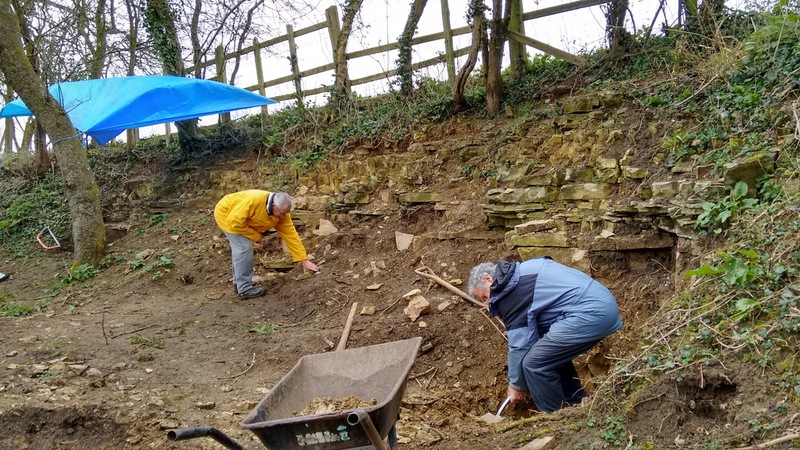 Good progress has now been made, over two work days, to provide a great example exposure to tell the story of Saltford Geology, in a Trail, to be set up by local man, and well known palaeo man, Simon Carpenter, as shown in the photos here. In good relaxed friendly geology keenness fashion all 5 or 6 on the team on the 2nd work day, some weeks back now, near the Bristol to Bath cycle path, gathered and dug. 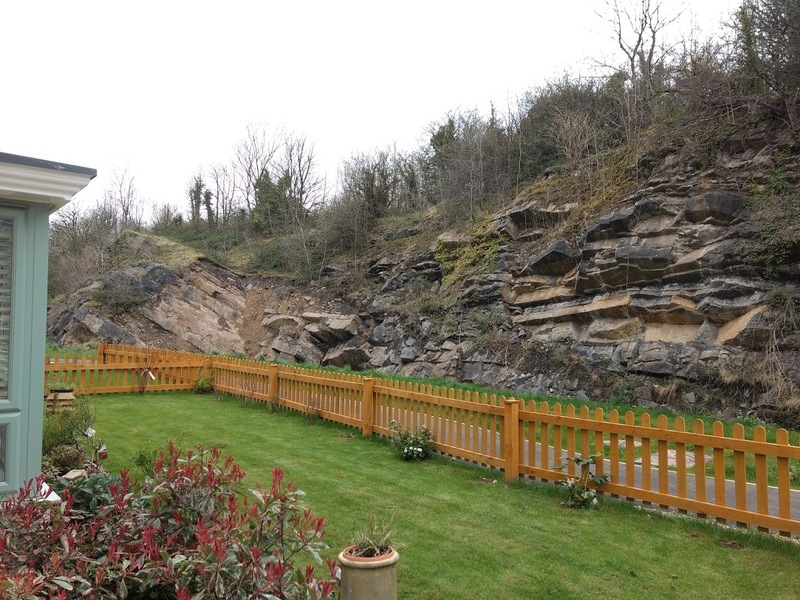 …..Keen to unearth more of the wonders of the special and definitely Regionally Important geology found in Saltford. Simon (Carpenter) leading the way from the top of the embankment, which lies to the north of the former railway cutting, digging downwards through the strata, exposing a very good section,… towards the Cotham Marble bed….. To be hit very soon now, we hope…next Work Day! -Do join us. The more the keen hands the better. With the pylon at Aust coming up close to its 50th anniversary it is time that National Grid and Trant Engineering Limited give the concrete pillars it is stood upon some major renovation. As part of these works, that will continue throughout 2016, the concrete causeway that leads from the old ferry crossing down to the pylon will be in constant use. Over many years soil and clay have accumulated at the base of the adjacent cliffs forming a huge bank pushing against the causeway. It was time for the bank to be removed. During the first two weeks of February I was on site with a watching brief both for water birds using the foreshore and for fossils as the bank (talus) was removed and laid out across the beach. Two dumper trucks and two diggers were involved in transporting the soil and clay down to the beach. It was laid in two long rows along the beach enabling me to look through it. Although there was some rock amongst the talus it was mainly slabs of shelly limestone rock that revealed some lovely bivalve fossils but nothing more. However, time on the beach did give me the chance to find plenty of Rhaetic bonerock – mostly containing the usual mix of tiny teeth, coprolites and fish scales. A few boulders revealed larger bone and shark spines. I will be transferring the finds to Bristol Museum & Art Gallery – hand size pieces will be used as handling objects for learning activities. The bank itself has been cut back three metres and to a 45 degree angle. This will help reduce the pressure of future soil and clay building up against the road. The recent high tides have been washing through the talus and cleaning up any remaining slabs of limestone. Ed Drewitt. Thanks also to Joe Keating and Dave Marshall from the School of Earth Sciences, University of Bristol, who covered a day each.